TL; DR: For 250 years, Encyclopaedia Britannica has been imparting knowledge to those who use its products. As technology evolves, so have Britannica’s strategies and product channels. It has expanded beyond reference books to comprehensive educational materials for today’s tech-savvy, K-12 students and teachers. The company also provides professional-readiness training for the defense and civil aviation industries through its Britannica Knowledge Systems. It is all part of a strategy to help students learn better and professionals be better prepared. Many business professionals remember using a set of encyclopedias when they were young students. If they needed to know more about a subject — any subject — they would open up the corresponding volume in the multibook set to learn more about it. But as technology advanced so did the way people interacted with reference materials. Research became typing questions into a search bar, not opening a book to take a deeper dive into a subject. 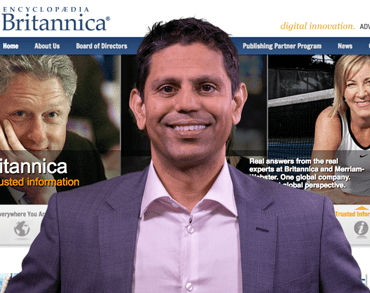 Britannica CEO Karthik Krishnan spoke with us about how the company is expanding its digital media presence. As a widely famous maker of reference materials, Britannica had to evolve its business model to align with the rapid adoption of digital technologies. 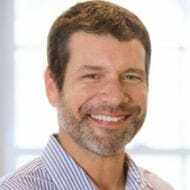 The company has innovated new ways to maintain its commitment to academia while also branching out into other areas, including training platforms for companies in high-skill industries. This “positive difference” includes enabling and educating not only students and teachers in the classroom but also professionals at companies like American and United Airlines through its training management systems. Britannica is branching out into the industries that need trusted information to help people learn, train, and excel. Britannica has assembled a learning brand ecosystem that includes the award-winning Merriam-Webster, the well-known dictionary, and Melingo, which offers products and services based on natural language processing of complex Semitic languages such as Hebrew and Arabic. As a company that has been in business for nearly 250 years, Encyclopaedia Britannica is adapting to changes in learning to remain an educational resource well into the future. Its mission is to offer the most trusted learning solutions in and out of the classroom. Encyclopaedia Britannica is a global company that is older than the United States. The company was founded in 1768 and produced exclusively printed reference materials until the 1980s, when it created the first digital encyclopedia (for LexisNexis) in 1981, the first multimedia CD in 1989, and the first encyclopedia on the Internet in 1994. Its last print encyclopedia edition was published in 2012, and, by then, the company had established a web presence and was well down the path to diversifying its digital resources. The company’s consumer-facing online properties are incredibly popular around the globe. 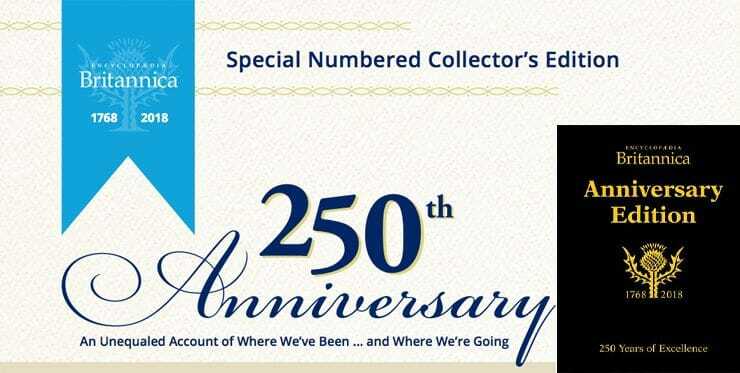 Encyclopaedia Britannica offers a 250th Anniversary Edition — its last printed yearbook — to commemorate its history. The company is diversifying its reach and expertise through its brands, with the goal of satisfying the educational needs of students, teachers, and professionals around the world. That means competing in key areas that will help the business grow. One focus has been on providing intuitive training and operational materials for businesses and government agencies through Britannica Knowledge Systems. Managing training operations, materials, and schedules can become burdensome for any business, but the challenge hits specialized industries much harder. In response, Britannica Knowledge Systems designed the Fox Training Management System for civil aviation, defense, security, and other corporate environments with complex training demands. In the civil aviation industry, precise performance is a necessity and workers at every level of the operation — from ground crew to pilot — need to have the proper qualifications, certifications, and safety training. Fox allows companies to run all training management and scheduling through one platform, keeping businesses running smoothly and winning awards for innovative programs. This initiative represents Britannica’s expansion into an area where educational materials and proactive training were needed. And Fox is not the only piece of the company’s portfolio of educational solutions that is making an impact. It also just launched a sophisticated system called The Optimizer, which facilitates the highest level of scheduling efficiency in the aviation industry. Britannica also continues to design products to develop learning skills and inspire curiosity in K-12 students, and it builds those products for today’s sophisticated digital environment. Students use many different sources — especially online — to find information, which increases the odds of relying on inaccurate or incomplete materials. Today’s teaching environment required the company to transition from a reference to an instructional and educational focus. Working with teachers, Britannica brought in more tools to help students learn the curriculum and subject areas. The focus is not only on making the material factually accurate but also easily understood and engaging. The company built its K-12 educational products around three important aspects: user experience and outcomes, content, and technology. Britannica’s LaunchPacks help educators go beyond the prescribed curriculum and helps students learn more intuitively. As teachers become even more sophisticated, they’re using more digital resources in the classroom and moving away from following just the school-issued curriculum. Now, they’re looking at supplemental materials, and Britannica’s products allow those educators to satisfy students’ additional learning needs. Those who need information on myriad subjects have turned to Encyclopaedia Britannica for nearly 250 years — or a bicenquinquagenary as Princeton University has called it. And the company continues to turn its attention to the future as it solidifies and grows its digital media footprint. The company has shown its commitment to innovation within the educational, training, and consumer spaces and continues to grow — even after 250 years.